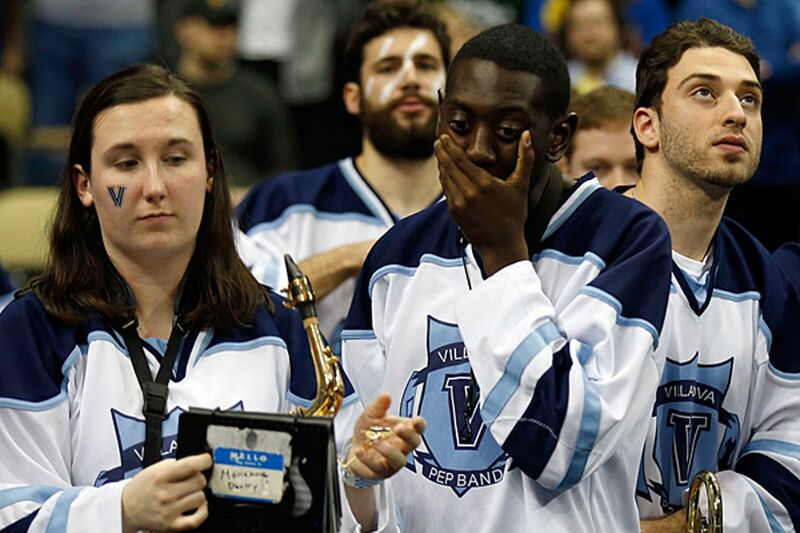 ON SATURDAY afternoon, she was just another member of the Villanova pep band. By Saturday night, she was famous. Google "Piccolo Girl" and up pops the now-familar image of Roxanne Chalifoux playing her small flute with tears streaming down her face immediately following Villanova's upset loss to North Carolina State. While the players and coaches exchanged postgame handshakes the cameras zeroed in on Chalifoux, who was wearing a Villanova-blue ribbon in her long brown hair as she somehow managed to play and cry at the same time. "Villanova wildcat till I die, through the smiles and the tears," Chalifoux later tweeted. Not surprisingly the footage went viral and #piccologirl exploded on the Twitterverse. Last night, almost 24 hours later, it was still a noteworthy moment, getting a mention on the NBC national news. And, of course, there were memes and comments. Someone superimposed Joe Biden standing behind her attempting one of his creepy, awkward kisses. Yeech! Someone else noted that "Crying Piccolo Girl" will be the most popular costume this Halloween.